The first and foremost responsibility of the Committee has been the Lectionaries for the Divine Service, that is, the appointed Readings and Propers for the Sundays and the Feasts of Christ throughout the church year. . .
Another primary responsibility of the Lectionary Committee is the Sanctoral Cycle, including both the Feasts of Christ and the Commemorations of the Saints. The Feasts of Christ—referring not only to such obvious occasions as Christmas and Easter, but also to the days of the Apostles and Evangelists—are intended for the celebration of the Divine Service, whether on Sundays or during the week. Hence, the Psalms are featured in conjunction with the Feasts of Christ in the same way they are used in the Lectionaries for the Divine Service. The Committee is giving careful consideration to all the Readings and Propers associated with these Feasts of Christ, beginning with those appointed in Lutheran Worship, but also taking into account the precedents of many other sources. 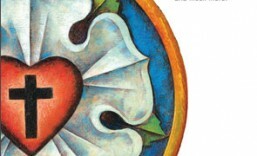 To aid and support the practice of daily prayer, the Lectionary Committee is planning and preparing for a Prayer Book in conjunction with the Synod’s new service book and hymnal. . . The proposed Prayer Book will be separate from the new service book and hymnal, and quite useable apart from it, although it will certainly also invite the use of the hymnal as an aspect of daily prayer. . .
One the most distinctive—and beneficial—characteristics of the proposed Prayer Book is the way in which the days of the year will be ordered and laid out in the book, arranged for ease of use—in the first part, according to the church’s Time of Easter, and in the rest of the book, according to the civil calendar. What this approach should accomplish is to make it very easy to know (and quickly to find) exactly where one should be in the book on any given day of the year. The Prayer Book will be designed to begin the devotional year with Ash Wednesday, in preparation for Holy Week and Eastertide: in much the same way that the church year originally began and developed around the Time of Easter (the weeks before and after the annual celebration of the Cross and Resurrection). . . The Prayer Book will be laid out to begin with Ash Wednesday, and to proceed from there with the days affixed to the Time of Easter (that is to say, in relation to the Sundays in Lent and the Sundays of Easter), through the Feasts of Pentecost and the Holy Trinity: so, basically a period of fourteen weeks, in which each day is identified with those Seasons of the church year, the dates of which fluctuate from one year to the next along with the moveable date of Easter Sunday. Presumably, most Christians are aware and familiar enough with Ash Wednesday, the weeks of Lent, Palm Sunday and Holy Week, the Sundays of Easter, and the Feasts of the Ascension, Pentecost and Holy Trinity, in order to find their way around this section of the Prayer Book without difficulty. The rest of the Prayer Book will be arranged differently, according to the dates that we all use to order and schedule our lives in this world: beginning with the earliest date that may follow the Feast of the Holy Trinity—that is, 18 May, in those years when Easter occurs at its earliest possible time—and then running consecutively through the months of the civil calendar (June, July, August, etc., right on through December, January, February) up until the latest possible date that may yet precede Ash Wednesday—that is, 9 March, in those years when Easter occurs at its latest possible time. Thus, for any given day of the year—outside the days and weeks of Lent and Easter—one will simply have to find that particular date in the Prayer Book, in order to find whatever Readings and Propers have been provided for that day. By fixing and assigning the Readings and Propers to specific days and dates of the year, not only will the Prayer Book be very clean and simple and easy to use by any layperson or family; it will also make it possible to incorporate an awareness and commemoration of the saints throughout the year, without distracting from or interfering with the continuity of prayer and devotion from one day to the next. Now, for each day of the year—whether in the Time of Easter or in the rest of the year—the Prayer Book will provide the actual text of two Readings from the Holy Scriptures, one Reading from the Old Testament and another from the New Testament. These daily Readings of the Word of God are to be the core content of the Prayer Book and the foundation for the daily prayer of the people of God. The selections from Holy Scripture from one day to the next will follow a semi-continuous course through entire Books of the Bible, thus adopting the most ancient Christian precedent and practice of a “lectio continua” (i.e. a “continuous reading”). This approach allows Scripture to interpret itself in its own literary contexts, and thereby also to inform and shape Christian prayer and devotion over the course of time. The semi-continuous reading of Holy Scripture does not mean that one must begin with Genesis and read straight through the Old Testament in order, nor with St. Matthew and so on through the New Testament; although Christians in the history of the church have done precisely that. A different sort of semi-continuous reading, which the proposed Prayer Book will follow, assigns the various Books of the Bible according to the liturgical seasons of the church year. Thus, by way of some more obvious examples, the Prophet Isaiah with his many prophecies of the coming Christ will be read during the Season of Advent, while the Acts of the Apostles will be read during the post-Pentecost Time of the Church. In such ways, the Readings of the Prayer Book will indeed relate to the church year in a broad, general fashion, but not in the more focused and specific way that one might expect on a particular Sunday or Feast of Christ. In fact, it is important to recognize and understand the difference and distinction between the Sundays and Feasts of Christ, on the one hand, and the cycles of daily prayer on the other hand. Each arrangement has its own particular character and pattern, and its own proper integrity. Attempts to combine the two result in a confusion of one sort or another. What is more, given a three-year cycle of Readings in one of the Lectionaries for the Divine Service, and then with the Historic Lectionary in addition to that, it would be impossible to develop a yearly cycle of daily Readings that would consistently relate in any logical way to the Sundays of the church year. Thus, the Prayer Book will use a broad relationship between the Readings of Holy Scripture and the liturgical seasons (which relationship should be especially obvious around the Feasts of Christmas and Easter; though, even there, not in a slavish fashion). The daily Readings will include about 20 verses from each of the Testaments of Scripture each day—or roughly 30–45 verses between the two Readings each day. That is not a large amount, but, again, the aim has been a resource that will be manageable and encouraging to all, instead of burdensome and disheartening. Depending on one’s circumstances, one might even divide the two Readings between different times of the day: the Old Testament in the morning and the New Testament in the evening, for example. Or one might choose to use only the Old Testament Readings for one year, then the New Testament Readings in the next year. In any case, including 20 verses or so per Reading allows for the use of almost the entire New Testament and roughly a third of the Old Testament over the course of the year. It is interesting, and fundamental to understanding the Treasury and the LSB Daily Lection, to note that the two arose together out of the work of Pr. Stuckwisch and the Committee as, practically, whole cloth. The proposed prayer book gave the form and structure to the Daily Lectionary, the Daily Lectionary is the beating heart of the prayer book. It was a great blessing to the Church that the Commission on Worship formally turned over the development and production of the proposed prayer book to Concordia Publishing House. 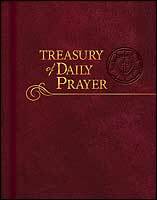 Finally, Reformation 2008, the foresight and work of the Committee will see some completion in the publishing of Treasury of Daily Prayer. Next time we will continue looking at Pr. Stuckwisch’s presentation and see how the Committee conceived some of the features that further shaped the Treasury. This entry was posted in Books, Post, Treasury of Daily Prayer and tagged Christian life, lectionary, prayer. Bookmark the permalink. Thanks, Scot, for making it happen. Everything I’ve seen of the Treasury of Daily Prayer looks outstanding, honestly a dream come true. I’m very grateful. Christ be praised!